The re-launch of a free and popular scheme is offering table tennis fans the chance to have fun and live a more healthy and active lifestyle. Ping! 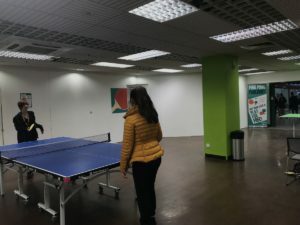 has planted table tennis parlours around various empty shop units and other ‘pop-up’ areas in Liverpool, to allow passers-by to have a quick game. Previously known as ‘Loop in the community’, Tennis England has funded this campaign working in partnership with local authorities to provide 23 venues across the city. Sport England has also helped in providing equipment, including tables, bats, balls and additional resources to kick start table tennis throughout the community. Sports Development Officer for Liverpool City Council, Sylvia Wensley, told JMU Journalism: “The successful opening of our Ping parlours has been extremely popular. JMU Journalism went to one of the Ping parlour partnerships in St. John’s Market to speak to locals and see what they thought of the social activity. Olivia Hunter, 16, told JMU Journalism: “It’s a good idea because it’s somewhere to go after College rather than hanging around at places; you can come and have fun. St. John’s Market’s parlour is available until October 31st, Monday through to Sunday. All the equipment you need is there alongside three tennis tables. The facilities offered around Liverpool can be found in numerous different areas around the city.